Thank God! It looks as if the floodwaters that caused so much grief in Texas are finally subsiding. Harvey, now just a tropical storm, is going off to dump more rain on other places… and now? It’s time to take a deep breath and thank God. It may sound crazy to give thanks to God, especially after disasters. I know many atheists wonder about why we Christians praise God, even in the midst of these horrific disasters, and I think that’s a very valid question. After all, there are some people who have lost everything. And yet, they thank God? For what? Destroying everything? For killing people? Yet, I think that surviving a natural disaster of this magnitude reminds us that we should take nothing for granted. Everything on this earth will pass away, and even we are mortal. When a disaster of this magnitude strips us of so much, we are cannot help but be confronted with this bare, horrible truth of our immortality. So, we thank God for all that He has given us. And we cling to Him so that, when our own demise comes, we will be with God and He will be our God. With that said! 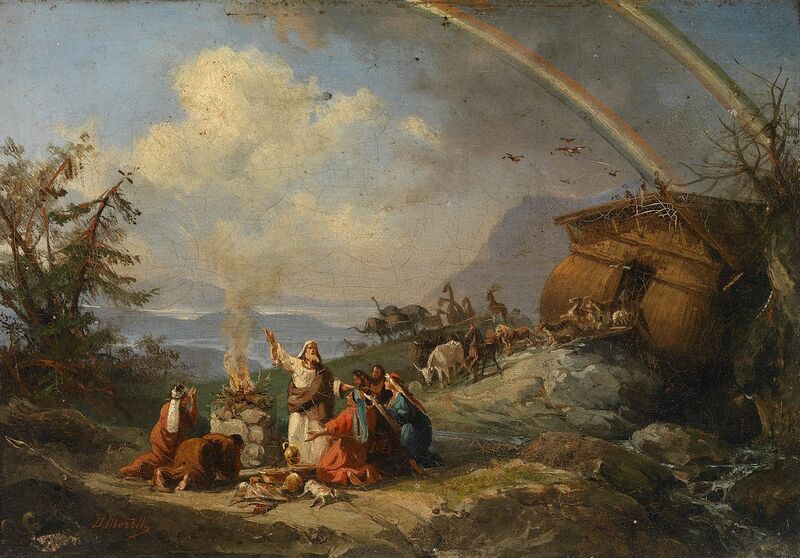 Here’s a painting of Noah and his family taking a deep breath and thanking God. After they left the Ark after that major flood, the first thing that they did was they made a sacrifice to thank God. And God, in turn, gave them the covenant, sealed with a rainbow, that never again would He destroy the entire Earth. Thanksgiving After Leaving the Ark, by Domenico Morelli, c. 1901. Private collection. Of course, after that, there was a lot of work to be done. And now Texas faces yet another hard task: finding out who and what survived the flood and cleaning up after everything. It’s a daunting task to be sure. I remember when I was a child, one of my family member’s houses flooded and my dad went up to help clean it up. I remember offering to help. After all, I loved playing in that house as a child and hoped that there would time to play. But my dad said no. It would be filthy, he said. You never knew what kind of things were washed up in a flood. Floods were no joke. And he spent a good weekend cleaning up muck at that house. And, even if you can’t give anything, please take some time to pray for the victims of Harvey and their families. There’s a lot of people who have lost everything, and their suffering is great right now. I know many would appreciate any and every prayers you send their way. Thank You for all the blessings that You have given us, especially the gift of life that You gave us on the Cross. Comfort the victims of this disaster in this time of great suffering. Help us focus on loving our neighbor more fully, especially during their time of need.